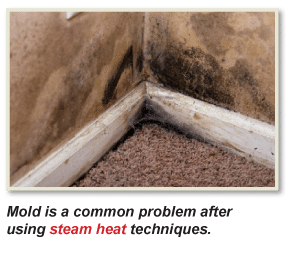 Best Bed Bug Treatment NJ is Heat!!! Rated the BEST Bed Bug Treatment – BedBug Chasers Bed Bug Heat Treatment NY – Heat is the oldest, cleanest and most efficient way to kill bed bugs in NJ and NYC with JUST ONE TREATMENT!!! Bed Bug Heat Treatment NJ is the most effective bed bug treatment to kill bed bugs in New Jersey , New York City or Westchester County apartments, homes, condos, movie theaters or anywhere else is by heating them quickly, a method called ‘Heat Shock‘. Since the early 1900s, bed bugs in NJ and NYC have been controlled by heating infested rooms or whole buildings to temperatures of at least 113 deg. Fahrenheit. Today, we know the critical temperature to kill all stages of bed bugs is 122 deg. Fahrenheit. Even though a Bed Bug Heat Treatment NJ is the most efficient, cleanest and quickest way to get rid of bed bugs in NJ while many other less effective bed bug treatments remain in the industry. Let’s compare these bed bug treatment methods and you will see why a heat treatment is the best to solve your bed bug control problems in New Jersey or NYC today! After reading through this list, you must wonder why so many ineffective and hazardous bed bug treatment options still exist. Bed Bug Heat Treatments using BedBug Chaser® electric convective heaters are safe, and designed specifically for indoor use. Don’t risk your family or your business to toxic and ineffective bed bug control NJ – the BedBug Chasers Bed Bug Heat Treatment NJ is for KILLING Bed Bugs not Controlling them!